Dr. Jonathan Thompson is an expert in Interventional Spine and Pain Management. A native of Louisiana and locally trained at LSU in New Orleans, Dr. Thompson’s Residency was in Physical Medicine and Rehabilitation (PM&R), with a 1 year ACGME-accredited Spine fellowship in Interventional Pain Medicine. 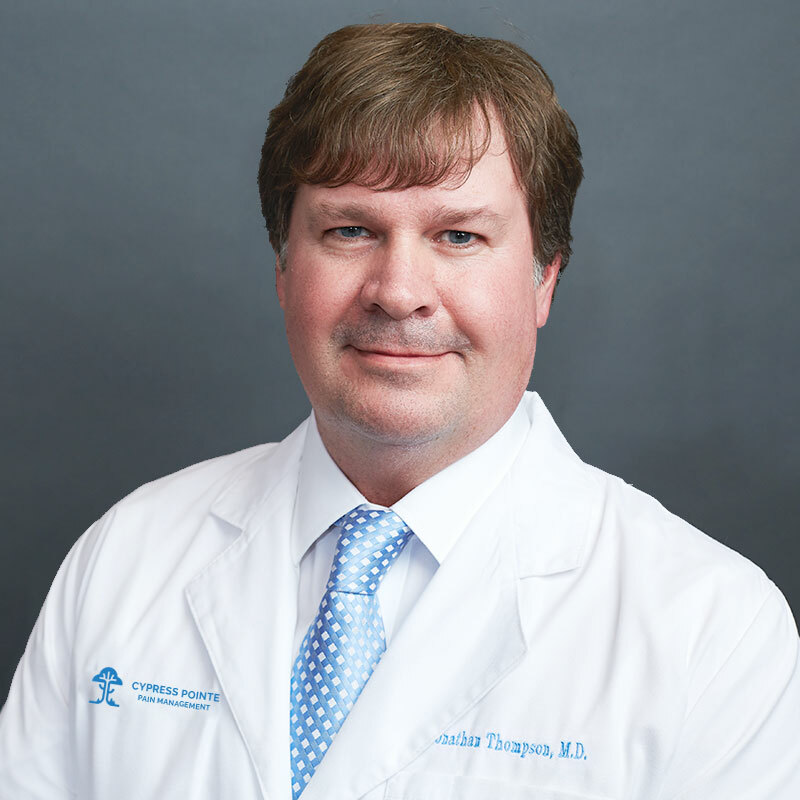 Dr. Thompson is Double-Board-Certified in PM&R and Interventional Spine & Pain Medicine. Highly trained in Interventional Spine procedures and Micro-Invasive Surgery for pain. Expert witness: Qualified as an expert witness in US Federal Court, Orleans Parish Civil Court, St Tammany Parish Civil Court, St Bernard Parish civil court, and Louisiana Worker’s Compensation courts. He lectures to Medical and Legal professionals, Insurance Industry, Case Managers, Rehab Counselors on complex pain disorders and diseases that result in functional debilitation and chronic pain. Dr. Thompson is trained in the most advanced technologies and treatments for acute and chronic pain conditions, such as Neurostimulation, Intrathecal Drug Delivery, and Radiofrequency therapies. He employs a multi-disciplinary approach to each patient to achieve the best physical function and quality of life. He takes pride in the time and accessibility he provides in caring for his patients.